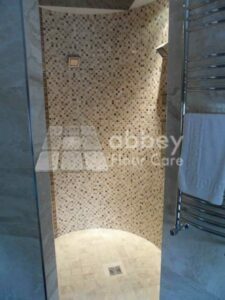 Are you finding it difficult to clean your marble shower walls? If you have any of these problems, then this informations will make your life so much easier. Marble and any other calcium based stones such as limestone or travertine can easily be damaged by everyday cleaning soaps, shampoos and conditioners because they contain acids. Acids dissolve calcium, creating a rough dull surface. This means that any time an acidic shampoo is used in the shower, it will damage the surface of the marble. To help combat this problem the usual solution is to use an impregnating sealer on the marble, and keep it topped up every few months. Unfortunately impregnating sealers do not prevent acidic spills etching the marble. So over time dull spots will start to appear. The solution is really quite a simple one. If you rub marble wax into the stone it will offer greater protection against acid attack because it forms a thin acid resistant film on the surface of the stone. The wax also makes the surface of honed marble and travertine slippier, so water runs off it better. It’s just like the effect when you wax your car and the water then beads up on the surface. Like impregnation sealers, marble wax is not a permanent solution. You still need to top it up every three to six months depending on the use of the shower. Nevertheless, many of our customers find it a brilliant solution to dull shower walls. Before applying marble wax make sure the walls are dry. Marble wax is best applied using 0000 fine grade wire wool. It can be applied by a cloth, but the cloth can “pull” on the, making the work harder than it needs to be. After ten to twenty minutes the wax will have dried ready for buffing. Again fine wire wool is ideal for buffing the wax to a sheen or a polish. Once you have finished be sure to vacuum the area to remove all spent wire wool fibers, because if they get wet and go rusty, they will stain the marble. Marble wax can also be useful in protecting marble window sills and vanity units.